Heidi Hopkins Christmas Decoration with a lovely Santa puzzle! Heidi Hopkins is a wonderful Wife, Mom, Grandparent, Daughter, Friend, and Sister to me. She is a creative Homemaker and everything she does fills a room with joy!! Today she is here to show us how we can create beautiful Christmas memories with puzzles. 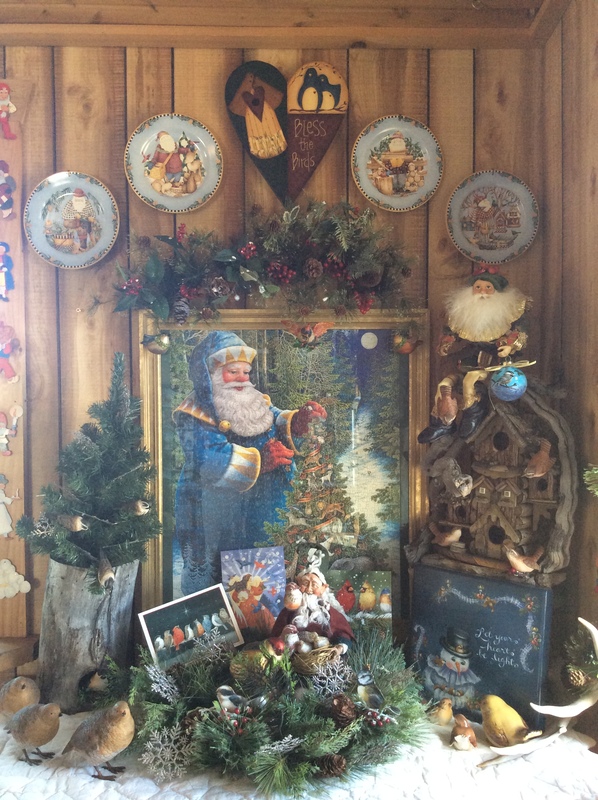 The adorable picture above is displayed in a corner of her festive cabin. I could just hang out in her home all day and drink a warm cup of peppermint cream coffee and put a puzzle together while listening to Christmas music. For many of us, the holidays are about being with loved ones and making special memories. Amid all the hustle and bustle, it’s so important to include our children or grandchildren in the festivities. For many Christmases, we have sat around the table as a family, to put a puzzle together. We always choose one with a winter theme or even one with Santa himself! While putting our puzzle together, we exchange stories, thoughts and lots of laughter. Hot chocolate and Christmas cookies are enjoyed by everyone. A wonderful bonus to our puzzle day is the piece of art we will be able to enjoy for many years to come. Once our puzzle has been glued to a very thin sheet of wood or even heavy cardboard, we can then frame it. I’m always keeping my eyes open for cheap frames at garage sales and thrift stores. On the backside of our framed “masterpiece”, everyone gets to sign it. It’s always nice to put the year on it too. You could also let your little ones put their handprint on the back as well. May all your Christmases be full of joy, love and happy memories……..
Heidi thanks so much for sharing your story and your captivating Christmas display. Heidi has another post that she shared with us a couple of weeks ago for Homemaking and if you have not seen it yet, you might want to check it out. It makes me want to go get a Christmas puzzle!!! Heidi my sister is full of great inspirational ideas. I always look forward to seeing what she has next to share with us. I love this idea! I would never have thought of this. My kids love puzzles so this would be a great Christmas tradition to create with them. Thanks for sharing. Thanks for coming by Abby, I was just up at my sisters and I saw another puzzle hanging up with birds!!!! It was so pretty. I been on a search myself looking for puzzles now!!! !